The organic-matter carbon isotope discrimination (Δ) of lichens with a wide range of photobiont and/or cyanobiont associations was used to determine the presence or absence of a carbon-concentrating mechanism (CCM). Two groups were identified within the lichens with green algal photobionts. One group was characterised by low, more C4-like Δ values (Δ < 15‰), the other by higher, more C3-like Δ values (Δ > 18‰). Tri-partite lichens (lichens with a green alga as the primary photobiont and cyanobacteria within internal or external cephalodia) occurred in both groups. All lichens with cyanobacterial photobionts had low Δ values (Δ < 15‰). The activity of the CCM, organic-matter Δ values, on-line Δ values and gas-exchange characteristics correlated with the presence of a pyrenoid in the algal chloroplast. Consistent with previous findings, lichens with Trebouxia as the primary photobiont possessed an active CCM while those containing Coccomyxa did not. Organic Δ values for lichens with Stichococcus as the photobiont varied between 11 and 28‰. The lichen genera Endocarpon and Dermatocarpon (Stichococcus + pyrenoid) had C4-like organic Δ values (Δ = 11 to 16.5‰) whereas the genus Chaenotheca (Stichococcus — pyrenoid) was characterised by high C3-like Δ values (Δ = 22 to 28‰), unless it associated with Trebouxia (Δ = 16‰). Gas-exchange measurements demonstrated that Dermatocarpon had an affinity for CO2 comparable to those species which possessed the CCM, with K0.5 = 200–215 μ1 · 1−1, compensation point (Γ) = 45–48 μl · l−1, compared with K0.5 = 195 μ1 · 1−1, Γ = 44μ1 · 1−1 for Trebouxioid lichens. Furthermore, lichens with Stichococcus as their photobiont released a small pool (24.2 ± 1.9 to 34.2 ± 2.5 nmol · mg−1 Chl) of inorganic carbon similar to that released by Trebouxioid lichens [CCM present, dissolved inorganic carbon (DIC) pool size = 51.0 ± 2.8 nmol · mg−1 Chl]. Lichens with Trentepohlia as photobiont did not possess an active CCM, with high C3-like organic Δ values (Δ = 18‰ to 23‰). In particular, Roccella phycopsis had very high on-line Δ values (Δ = 30 to 33‰), a low affinity for CO2 (K0.5 = 400 μ1 · 1−1,Γ = 120 μ1 · −1) and a negligible DIC pool. These responses were comparable to those from lichens with Coccomyxa as the primary photobiont with Nostoc in cephalodia (organic Δ = 17 to 25‰, on-line Δ = 16 to 21‰, k0.5 = 388 μ1 · 1−1, Γ = 85 μ1 · 1−1, DIC pool size = 8.5 ± 2.4 nmol · mg−1 Chl). The relative importance of refixation of respiratory CO2 and variations in source isotope signature were considered to account for any variation between on-line and organic Δ. Organic Δ was also measured for species of Anthocerotae and Hepaticae which contain pyrenoids and/or Nostoc enclosed within the thallus. The results of this screening showed that the pyrenoid is correlated with low, more C4-like organic Δ values (Δ = 7 to 12‰ for members of the Anthocerotae with a pyrenoid compared with Δ = 17 to 28‰ for the Hepaticae with and without Nostoc in vesicles) and confirms that the pyrenoid plays a fundamental role in the functioning of the CCM in microalgal photobionts and some bryophytes. This research was funded by Natural Environment Research Council grant no. GR3/8313. 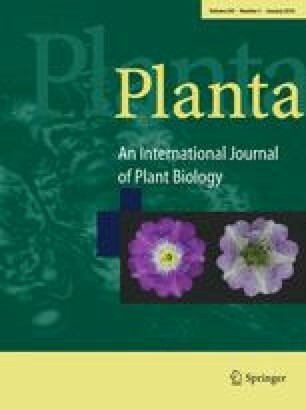 The authors would also like to thank Dr. B. Coppins, Royal Botanic Gardens Edinburgh and Prof. A. Roy Perry, National Museum of Wales, for access to herbarium collections, Dr. T. Booth for confocal microscopy work and Dr. A.J. Richards, University of Newcastle upon Tyne and Dr. O.L. Gilbert, University of Sheffield for identifying bryophytes and lichens respectively. E.S. would particularly like to thank Dr. M. Broadmeadow, The Forestry Authority, Farnham, Surrey, and Cristina Máguas, Universidade de Lisboa, for their advice and expertise at the beginning of the project.